This was absolutely delicious, really flavourful. 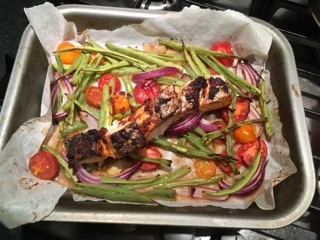 I used tomatoes from my garden and runner beans from my Mum's garden, lovely and fresh tasting. Toss the runner beans with the preserved lemons, onion and tomatoes. Arrange over the base of a small roasting tin. Season and drizzle with oil. Make several slashes in the skin of the salmon and spread with the tapenade push it into the slits. Place skin side up on the beans. Cook in the oven for 20-25 mins until the fish is cooked through. Serve with potatoes.